Our parties are usually two hours long and can include balloon modelling, magic, dancing, games, fun competitions, bubbles and glitter tattoos. We provide the sound system, microphone, and all the party music. We also provide lots of props that we use during the party like balls, poms, ribbon dancers, bubble machines, puppets and parachutes keeping it very interesting, fast paced, varied and entertaining. Usually we start with a little bit of balloon modelling as the children are arriving. Then we do one hour of high energy games, activities, magic, bubbles, dancing and fun, and then is a great time for the party tea, or a quick drink break. As the children are eating or drinking, your entertainer will give each child a glitter tattoo which are very popular face paint stencils! Glitter tattoos are faster than face painting, meaning every child can have one. After tea it’s then time for lots more games and fun until the end of the party! Click here for a print of our party information. 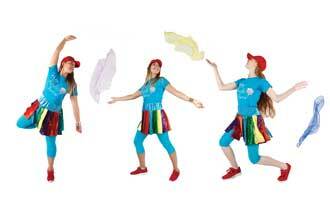 The price of our parties depends on the party length, amount of children invited and location of the party. Our prices include both the booking fee and the entertainer’s fee and also all the props, party prizes and a party theme of your choice. 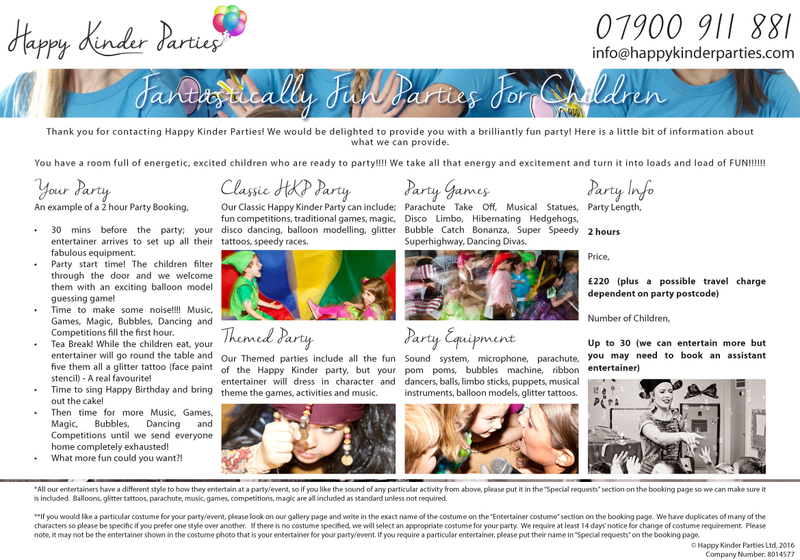 For larger scale parties and events please email us at info@happykinderparties.com for an accurate quote. Additional hours are charged at £60 per hour. 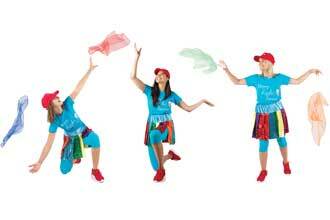 Please click here to see the party extras we provide and the costs. An additional travel charge may be applicable, depending on where the party is located. Please find your postcode here or email us to find out the travel charge to your area. If you are interested in special offers we do have mid-week (parties on Monday-Thursday), early-bird (parties starting at 10am or earlier), and last minute party offers, So do ask and we can let you know what is available!